For businesses looking for an ROI on coaching, or a measurable improvement in performance, frequently, it’s not one major breakthrough, rather, it’s a series of small gains that add up to major achievements. Sir David Brailsford, formerly performance director of British Cycling, current general manager of Team Sky, helped British Cycling achieve remarkable results. For over 100 years British Cycling had never won a Tour de France. 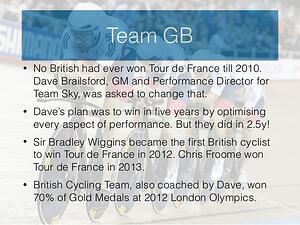 When Brailsford created Team Sky he predicted they would win it in 5 years. They won it in 2 years. See Brailsford and Team Sky’s achievements in this chart. Brailsford explains how he achieved this success through Core Principles and Marginal Gains in several YouTube videos. 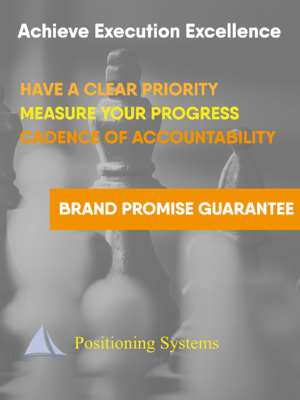 Follow these principles and your business can achieve similar success. As Brailsford’s Methods show, success isn’t getting one major breakthrough rather it’s doing many small things just a bit better, to overcome and beat your competition. 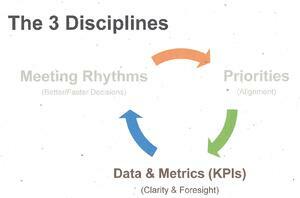 These are the same principles we use through Strategic Discipline and Scaling Up. Every thing can be measured. If you’re not measuring, you don’t understanding. C = Commitment - Screen people for commitment. Do they have an intrinsic desire toward achieving a goal? Are they committed to it? Commitment is different than motivation. Motivation ebbs and flows. Commitment is an underlying drive to where we want to get. You may have Immensely talented people, but if the commitment toward the goal isn’t present, Team Sky won’t work with them. O = Ownership - People don’t like to be told what to do, they don’t like being given non negotiable tasks to do. They like to be asked their opinion, not told what to do. Let your people have a say in what they are doing, in what their development plans are. Give them ownership. British Cycling requires everyone to have an opinion. It’s a professional obligation. “You’re expected to have an opinion and then wherever possible they work with collective opinion. Whenever you want to get the best out of somebody, create environment where people are free to speak, don’t feel frightened or under scrutiny to speak their mind. If they don’t speak to you, they’ll speak to somebody behind your back, and all of a sudden the dynamic of the team will disappear.” Take the crown off the head of the coach and putting it on the head of the rider. Giving them freedom and ownership over their development and training plan. When our coaches realized they were there to manage & support riders, everything started to flourish in the right direction. E = Excellence - This is personal excellence, not on the world stage, it’s about being the best YOU can be. It’s the best you can work for YOU. It’s excellence for themselves. Do your Core Values in your business provide this brilliance in expected behavior for your people? Brailsford feels this is more of a philosophy than a tangible system. Starting at about 7:30 on the video, Brailsford explains his discussions with his mechanics on tires, how they push back on suggestions, that’s not his job, it’s their job, leave it to us. This is highly ineffective in a team. It’s a team concept we want to develop. What do Marginal Gains look like? The Video provides two examples. Here’s one you may struggle with, spending a lot of time in meetings. Brailsford measured the time invested, set up the exactly same format for their meeting agendas, minute taking, follow up action steps, eliminate interruptions, specify what the outcome should be. (See our ScaleUp meetings) Team Sky moved from ineffective to effective meetings. That’s a marginal gain. 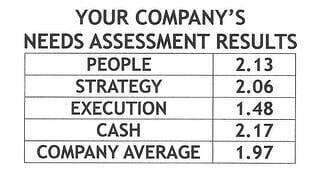 Consistently planned daily, weekly, monthly, and quarterly meetings, focusing on performance metrics drive performance gains. To achieve Marginal gains, often you don’t have to innovate imaginatively or dramatically. In Good to Great Jim Collins described success as steady slow progress on the flywheel. 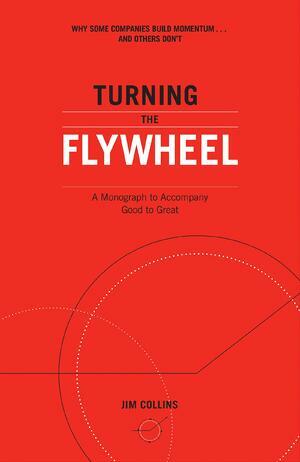 Collins’ new book Turning the Flywheel describes how Amazon and small businesses and departments use the flywheel concept to achieve greatness. You can to. How next blog.